The Lifecycle of a Tooth From those earliest painful eruptions (the unforgettable screams of a teething baby), through the tooth fairy, wisdom teeth, root canals and rot, your teeth have a lifecycle all of their own. Here's a look at your pearly whites. As people age and put more mileage on their teeth, they can become brittle, slightly darker, and the gums may begin to recede. The teeth are more vulnerable to decay and infection. Do you cringe when you drink something too hot, too cold or too sweet? Even if you don't feel any pain, these can be signs of more than just a sensitive tooth —you might have a cavity. Over time, bacteria in the mouth feast on the sugar and starches that remain after you've eaten. They can release nasty acids that eat away at a tooth's enamel, sometimes creating cavities. Dentists say it's best to deal with decay early because the infection can eventually penetrate the tooth enamel and dentin and reach the pulp, if it has enough time. If infection reaches the pulp, the blood vessels and nerves in the tissue also become infected and inflamed. Swelling builds and, with nowhere to go, the pressure creates an intense pain. When cavities are caught in time, dentists usually fill them with a silver-colored amalgam of several metals or a tooth-colored resin. If not treated in time, a root canal may be necessary. In this procedure, the dentist drills a hole through the tooth to access the pulp, digs out the tissue, and replaces it with a synthetic filling. The best prevention? Brushing and flossing regularly. Most parts of our body are pretty much formed at birth. As we get older, our organs develop and grow, but their physical form stays fairly constant. From the earliest painful eruptions (that often bring the unforgettable screams of a teething baby), through the tooth fairy, wisdom teeth, root canals and, ultimately, rot, teeth have a lifecycle all of their own. Here's a trip through the life of a tooth. When a new mother looks down into the gaping mouth of her wailing newborn, she sees a tongue and pink gums. No teeth. But looks can be deceiving. Inside those newborn gums, the front teeth are already formed, and many others are well on their way. The teeth start forming just six weeks after conception, when little buds from the lining of the mouth grow down into the developing jaw below. There are 10 buds on top and 10 on the bottom — one for each baby tooth. In rare cases, a baby is born with one of those teeth partly erupted – or partly broken through the gums. But for most kids, the joys of teething begin at two to three months old. Then, after some four months, several teething rings and plenty of Orajel later, the first few pearly whites make their big debut. Each tooth has a unique shape. Together, they will become the perfect chewing machine. As teeth develop, they can take on different shades. Some kids have blindingly white teeth, and others have teeth that emerge a little yellowish. Sometimes, new baby teeth even have a bluish hue. That's because the pulp — the inside of the tooth which contains the nerves and blood vessels — is a little bigger in a baby tooth, says Dr. Mark Ryder, professor and chair of periodontology at the University of California San Francisco School of Dentistry. And the outer layers —the dentin and enamel — are a little bit thinner and not completely opaque, creating a bluish cast. But don't fret if a child's teeth are not gleaming white. "White or bright may not indicate too much about the health of the tooth. As dentist[s], we are really concerned about the health of the teeth, not the shade," says Dr. Jarshen Lin, professor and director of predoctoral endodontics at the Harvard School of Dental Medicine. Tooth color, he says, has a lot to do with genetics. A child's tooth is likely to have a base color that is similar to mom's and dad's. But time progresses, other things like drinking coffee and tea, taking certain drugs, and even just getting older also affect the color of teeth. Baby Teeth: A Free Pass? Yellow or white, dull or bright, baby teeth fall out anyway. So who cares, right? Candy and cavities for all! Not so fast, Lin says. Baby teeth aren't just for chewing. They also serve as space-holders for adult teeth, meaning that the permanent tooth will grow into the space left behind when the baby tooth falls out. "If you eat too much candy and lose the baby teeth prematurely, you're going to lose the space," Lin says. If baby teeth aren't correctly spaced — and they often aren't — an orthodontist might recommend a retainer to try to correct the problem. So if baby teeth are not a free pass, what's the point? Why don't we just get our adult teeth to begin with, and skip the whole tooth-fairy thing altogether? "Baby teeth are, as you know, a lot smaller. The whole scale of a baby is a lot smaller too," Ryder says. "If you tried to grow grown-up teeth and have them erupt in the baby's mouth, you just wouldn't have enough space." Developing permanent teeth eventually puts pressure on the roots of the baby teeth, which anchor them to the bone. This usually happens between the ages of six and eight. The roots break down and are reabsorbed into the gums, making the baby teeth "loose." By the time the tooth falls out, most of the root is already gone, and the tooth fairy only gets the crown. It can take about six months for the adult tooth to come in, which leads to many a toothless grin. The first two sets of molars usually come without a glitch into empty spaces in the back of the mouth, with the initial group arriving at age six and the second set at age 12. But the third set of molars, the wisdom teeth, can cause much angst. They're part of the normal sequence of tooth development and once served a valuable chewing function in early humans. One hypothesis has it that as people evolved to eat more refined foods, the jaw shrank, while tooth patterns stayed the same. These days, many people are born with a jawbone that just can't accomodate another set of molars. Often, this causes the wisdom teeth to become "impacted," meaning they get wedged in sideways between the jawbone and the molars that come in at age 12. Even worse, sometimes they start to erupt, get stuck and cause an infection. Lin says the size of the jawbone is genetic. 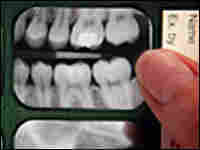 Tooth patterns, and therefore the fate of wisdom teeth, tend to mirror those of one's parents. Some 10 million wisdom teeth are extracted from five million people in the United States every year, according to a September 2007 article in the American Journal of Public Health. As people age, cavities in the dentin become more common. Dentin is usually hidden but can be exposed if years of chewing wears down the enamel, or if receeding gums reveal the outer layer of dentin on the roots of the teeth. 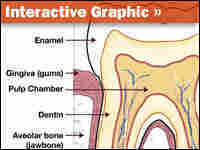 Dentin is softer than enamel and especially prone to cavities, Ryder says. Older people often produce less saliva, so there's less lubricant to wash away the bacteria that cause tooth decay. In addition, less saliva can also make teeth more brittle and prone to fracture. Periodontal disease, which refers to decay in the surrounding supportive tissues, is another concern as we get older. Even if a tooth itself is perfectly healthy, the bone and gum that anchor the tooth in place can become seriously infected. The otherwise healthy tooth can become loose and even fall out. But don't despair— things are looking up for the elderly tooth. Ideally, people don't ever need to lose their teeth if they take good care of them, Ryder says, adding that dentures could become a thing of the past. For one thing, he says, "the public has become more aware of the importance of dental health." Public health campaigns have done their job, and more people are brushing after meals and flossing every day, he says. And dental hygiene has improved as "people have become more concerned with what they look like from an aesthetic point of view," Ryder says. In other words, vanity may be good for our teeth. Fluoride has also played a part. People who were exposed to fluoride during tooth development are likely to have stronger teeth, Ryder says. People over 70 might not have had access to fluoride. But as younger generations that were exposed to fluoride get older, their teeth may stay stronger, he says.